lancing device, 10 Microlet colored lancets, logbook and carrying case. Alternate Site Testing! Give your fingertips a rest! A Half-Microliter Blood sample is one of the smallest of all meters! Store up to 250 test results with Averaging! High Performance Meter for a Low Low Price! INDICATIONS:It’s Automatic Coding. Alternate Site Testing. Tiny Sample Size (0.5ul). Biosensor Technology. Results in 5 Seconds. Blood Applied, Capillary Action, Automatic start. It offers automatic coding providing unparalleled accuracy with fewer steps and it is easy, simple and accurate. The Infinity Meter is the newest tool from U.S. Diagnostics for managing your diabetes. Enjoy the accuracy of a coded meter with the ease of use on no code. Featuring Biosensor Technology, Infinity offers the latest in blood glucose testing in a convenient easy-to use meter. Boost Glucose Control Drink is a balanced nutritional drink specially formulated for people with diabetes. 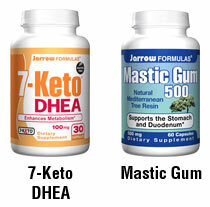 It contains a unique blend of protein, fat, and slow digesting carbohydrates designed to help manage blood glucose levels as part of a balanced diet. When your busy schedule makes healthy eating difficult, Boost Glucose Control can help. In its convenient plastic bottle, it’s an easy and nutritious option as a mini meal or snack. Only 1 Carbohydrate Choice per 8 fluid ounce serving. More than 16 million people in the U.S. have difficulty maintaining their healthy glucose levels (CDCP, 1998). The Westernized diet is high in sugar and refined starches that are quickly converted to glucose once they are ingested. This causes rapid fluctuations in blood sugar and insulin levels, putting stress on the body. Also, an increasing number of overweight adults and children in the U.S. are developing impaired glucose tolerance and other metabolic conditions. 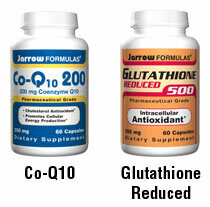 Comprehensive combination of nutrients that promote glucose metabolism and antioxidant protection*. A unique blend of the vitamins, minerals, and botanicals. View larger. It is important to have well-balanced blood glucose and insulin levels. A growing number of scientific studies suggest that proper glycemic balance can significantly enhance cardiovascular, immune and bone health, energy production, metabolism, and overall well-being. If you have a medical condition (especially diabetes or glucose control problems), are pregnant, lactating, or trying to conceive, are under the age of 18, or are taking medications (especially for diabetes or glucose control), consult your health care practitioner before using this product. 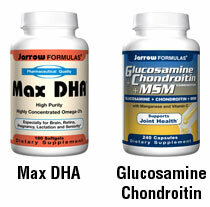 Jarrow Formulas’ complete line of over 350 nutritional products includes vitamins, minerals, probiotics, standardized herbal concentrates, amino acids, enzymes and enteral nutrition products. Customers can be assured of purity, value and potency when choosing these products. 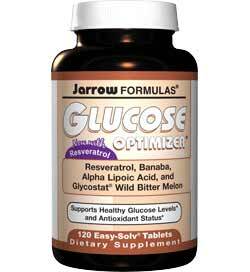 Jarrow Formulas Glucose Optimizer, 120 Tablets. In their groundbreaking books on the benefits of a low-GI diet, world-renowned researcher Jennie Brand-Miller and her team have changed the way the world thinks about food and nutrition. Eating according to the glycemic index has never been more popular than it is nowand it just got easier. From general health concerns to losing weight to managing chronic conditions such as diabetes and heart disease, the Shopper’s Guide has everything you need to know about managing your health through your eating habits. The GI tablescomprehensive lists of foods and their glycemic index valuesare the key to unlocking the remarkable health benefits of a low-GI diet. This year’s edition of the Shopper’s Guide is an essential tool for your health and wellness. Maintaining proper blood sugar levels is important. Diet and exercise are key to lowering one’s risk of developing diabetes. Glucose Support can also provide vital diabetes support in a convenient liquid form. Unless you have done extensive research, choosing which ingredients are necessary for supporting proper blood sugar levels and the amount of each ingredient can be a daunting task. We have done that for you by combining what you need into a high quality, cost-effective liquid formula. To raise blood sugar quickly, ReliOn Glucose Tablets deliver fast-acting carbohydrates to relieve hypoglycemic episodes. 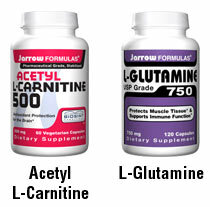 What’s more, they contain no fat, caffeine or sodium and are naturally cholesterol free. Many people with diabetes are not sure how to effectively avoid and/or manage hypoglycemia. The foods most commonly used to treat this condition (candy, cola and juice) contain sucrose or fructose which requires time to break down into glucose, delaying relief of hypoglycemic events. Because it is difficult for patients to be sure how much glucose they are metabolizing with these foods, they tend to over-treat, turning hypoglycemia into hyperglycemia. Raises blood sugar quickly to relieve hypoglycemic episodes. 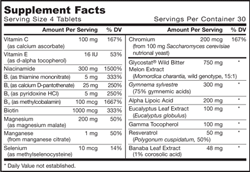 4 grams of fast acting carbohydrates per tablet. A Fat-Free Food, No Sodium, No Caffeine. This study aimed to investigate the cut-off value of glucose challenge test (GCT) for screening Gestational Diabetes Mellitus (GDM) in a Bangladeshi population. A total of 224 Bangladeshi pregnant women who underwent a GCT were prospectively investigated. GCT was performed between 24 to 28 weeks of gestation. Women demonstrating GCT exceeding 130 mg/dl (>7.2mmol/l) received a 75 g, 2 hr oral glucose tolerance test to determine whether or not they had GDM. Twenty three (10.3%) women were diagnosed to have GDM. The receiver-operator characteristics curve identified a GCT finding above 174 mg/dl as the cut-off value for detecting GDM, which showed sensitivity, specificity, PPV and NPV of 35%, 90%, 80% and 68% respectively. Based on PPV and NPV, our data suggest that 1 hr-50g GCT is a feasible and acceptable screening test and a cut-off value of 174 mg/dl, as the post-challenge serum glucose, may be appropriate for screening GDM in Bangladeshi population by this test. New Mechanisms in Glucose Control presents a clear overview of the new drugs and treatment therapies that have been developed in recent years to help improve glycaemic management for the diabetic patient, namely the incretin mimetics (GLP-1 agonists) and DPP-4 inhibitors. It also considers other drug classes currently in development and undergoing clinical trials including the SGLT2 inhibitors and other pipeline products. In addition to pharma cotherapeutic agents, the role of bariatric as a management tool for diabetes is covered as well as consideration of the organisation of diabetes care with a community focus. This indispensable pocketbook details the newer treatments and offers a comparison with more traditional agents including sulphonyureas, glitazones and insulin. The pros and cons of traditional therapies are discussed as well as the epidemiology and pathogenesis of type 2 diabetes, helping to give the reader a better understanding of the disease area and its management. New Mechanisms in Glucose Control is essential reading for health professionals working in primary or secondary care and involved in treating diabetic patients. Abbott FreeStyle Lite Blood Glucose Monitoring System Test Strips No coding requiredThis makes it easier and more convient to begin testing. For in vitro diagnostic use only. Virtually pain-free testing. Use only with FreeStyle Lite System. For self testing. No coding requiredThis makes it easier and more convient to begin testing. For in vitro diagnostic use only. Use only with FreeStyle Lite System. EasyGluco Blood Glucose Test Strips is a great choice for your Diabetic Monitoring. Its quick, (get results in 9 seconds) and easy to use. EasyGluco blood glucose test strips are used for testing outside the body. These are are used with EasyGluco Blood Glucose Meters for the quantitative measurement of blood glucose level in whole blood. Tiny blood sample, less pain. Accurate results in 9 seconds. Bayer HealthCare LLC does not warrant use of the Ascensia Breeze2 Blood Glucose Meter with any strip other than Ascensia Breeze2 Blood Glucose Strips. For complete warranty information, refer to User Guide. For in vitro diagnostic use. Before using this product, read the package insert. Store between temperature 59 -86° Fahrenheit and out of direct sunlight. Do not use after expiration date. For sale in U.S.A. only. Reagents: 10% w/w glucose oxidase (Aspergillus niger, 24 U/mg) 68.5% w/w potassium ferricyanide 21.5% w/w nonreactive ingredients. For questions or comments, or help with reimbursement, call: 1-800-348-8100, or www.bayerdiabetes.com. Bayer HealthCare LLC is dedicated to providing the highest quality products and services to our customers. 50 test strips, ((5)10-test disc), No strip handling, Only Use with Ascensia Breeze2 Blood Glucose Meter. Only Use with Ascensia Breeze2 Blood Glucose Meter. For use with ACCU-CHEK® Aviva System. Two 2.5ml bottles of control solution, one for high-level test and one for low-level test. Two 2.5ml bottles of control solution, one for high-level test and one for low-level test. For use with ACCU-CHEK® Aviva System. This popular guide is helpful to both young and old people who have diabetes and those who care for them. Diagnosis and Assessment – An in-depth look at the three primary blood tests used to diagnose diabetes, including fasting plasma glucose, oral glucose tolerance test, and casual plasma glucose. Self-Monitoring of Blood Glucose – Self-monitoring allows patients to take control of the disease, since everything they do and everything that happens to them affects their blood sugar. The two methods of self-monitoring, meter testing and visual testing, are reviewed. Type I and II Diabetes – Detailed information about both the onset and symptoms of both Type I and Type II diabetes is examined. Using Diet and Exercise to Manage Diabetes – Practical information on how to approach diet, exercise, and relaxation techniques when treating your diabetes. Insulin Related Ailments – A review of the three main insulin related ailments that are of primary concern for diabetics: hypoglycemia, hyperglycemia, and ketoacidosis. Take advantange of this easy-to-read guide as you or a loved one learn to manage diabetes effectively. The Solo V2 test strips are clearly marked to show which end is to be inserted in the meter and which side is up. The strip itself contains 4 leads which is advantageous in getting a better, more accurate test. The test strips include “Vortex Action” which is a powerful current that draws the blood from the test site and moves it rapidly into the strip. This action delivers faster, more accurate results and reduces chances for errors. The Solo V2 test strips were designed to be large, easy-to-handle test strips. The strip bottle also has a wide mouth opening, making it easier to access the strips. Please note: there are 50 strips per vial. ACCU-CHEK Compact Plus Diabetes Meter. Sale contains, Meter Manual only………………. This data cable, for use with the Blood Glucose Meter, allows you download your blood glucose test readings to your computer using your computer’s USB port. It is compatible with Bayer Ascensia blood glucose meters. INDICATIONS: Freestyle Glucose Control Solution Allow user to perform quality control checks to ensure that Freestyle meters and test strips are working right. For use with the FreeStyle blood glucose monitoring system. Freestyle Glucose Control Solution Vial used with the FreeStyle blood glucose monitoring system. Allow user to perform quality control checks to ensure that Freestyle meters and test strips are working right. iPet Glucose Monitoring Kit For Dogs and Cats is an easy, effective kit for monitoring glucose levels in pets. Everything you need to get started is included. With over 1 million copies sold of the three previous editions, The New Glucose Revolution is the go-to book for all things GI. Now in its fourth edition, The New Glucose Revolution is completely revised and updated, expanding on the most recent scientific findings related to GI and health. It includes new chapters dedicated to pre-diabetes, pregnancy, and heart health; easy and delicious recipes; weekly low-GI menu ideas; and the GI values for more than 900 different foods and drinks, plus saturated fat and carbohydrate contents listed. On the heels of Dr. David Jenkins’ groundbreaking GI study (one of the largest and longest to assess the impact of foods with a low GI), the time is right to adopt and maintain a low-GI lifestyle. If you want to lose weight; manage your diabetes; and improve your blood glucose levels, cardiovascular health, and sense of well-being, this is the book for you. The advocate talking blood glucose monitor kit speaks to you in english or spanish. a small blood sample size of .7 microliter is all that is needed for testing. this monitor gives you fast results in 7 seconds and has 450 test memory. the large screen is great for visibility and has alternative site testing. you can use the palm, forearm, upper body, calf or thigh for testing blood glucose levels. the kit contains the talking glucose meter, owner’s manual, quick reference guide, warranty card, carrying case, 10 strips, 10 lancets, lancing device, and control solution. Bayer Contour TS test strips 50 ct.
* Flip-top bottle opens, closes and handles easily. * Bottle design keeps strips fresh up to 6 months after opening. * Easy viewing window of sample fills using Sip-in Sampling Technology. * Meter automatically turns on when test strip is inserted and does not require coding. This digital document is an article from Focus on Healthy Aging, published by Belvoir Media Group, LLC on April 1, 2008. The length of the article is 876 words. The page length shown above is based on a typical 300-word page. The article is delivered in HTML format and is available immediately after purchase. You can view it with any web browser. AlphaTRAK 2 Veterinary Blood Glucose Test Strips 100/box is accurate, easy to use, requires a tiny blood sample, provides results in seconds, and is made specifically for dogs and cats. For use with the Cholesterol Chek Glucose/Cholesterol Meter. Includes 50 Glucose Test Strips. TRUEread? Blood Glucose Test Strips Easy to handle and fill When you insert a TRUEread? test strip, your TRUEread? meter automatically and conveniently turns on. These capillary action test strips make it easier to test. Just apply the tip of the strip to your blood drop and it fills quickly for testing. Plus, you’ll hear a signal telling you that the test strip is filled. AlphaTRAK 2 Veterinary Blood Glucose Test Strips 50/box is accurate, easy to use, requires a tiny blood sample, provides results in seconds, and is made specifically for dogs and cats. This digital document is an article from Biotech Equipment Update, published by Worldwide Videotex on August 1, 2002. The length of the article is 1210 words. The page length shown above is based on a typical 300-word page. The article is delivered in HTML format and is available in your Amazon.com Digital Locker immediately after purchase. You can view it with any web browser. Title: PUMP THERAPY BETTER THAN INJECTIONS FOR GLUCOSE CONTROL. 10 x8 Print showing Test for urine glucose level. Test for glucose level in urine. The blue colouration on the end of the reagent strip indicates a negative (normal) result. Glucose levels in urine are raised in diabetes. Chosen by Science Photo Library. High quality RA4 prints. Printed on Kodak Endura and Edge papers. Size refers to paper used. This item is shipped from our American lab. PHOTOGRAPHIC PRINT This 10 x8 Print features an image of Test for urine glucose level chosen by Science Photo Library. Estimated image size 254x173mm. Image Description: Test for urine glucose level. Test for glucose level in urine. The blue colouration on the end of the reagent strip indicates a negative (normal) result. Glucose levels in urine are raised in diabetes. Screening test for early detecton of Diabetes. Also used for patient self-monitoring.